The pulp era's most murderous crime-buster continues his deadly war on criminals in two violent pulp novels by Norvell Page. 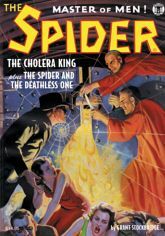 First, an ambitious madman spreads deadly disease throughout New York City while the police wage war upon the Spider�the only person who can save the city and bring "The Cholera King" to justice! Then, determined to destroy the U.S. defense industry, the fiend of 1,000 faces (known as "Munro") returns for a final battle in "The Spider and the Deathless One."